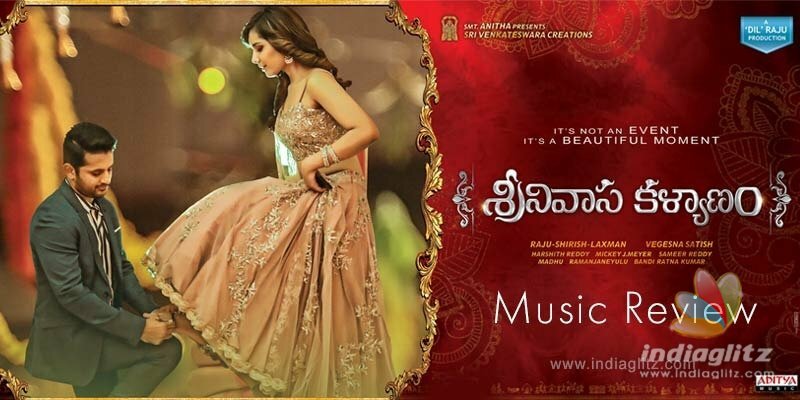 The album of 'Srinivasa Kalyanam' is out on Aditya Music. Composed by Mickey J Meyer, it has lyrics by Srimani and Ramajogayya Sastry (one song). SP Balasubramanyam, Dhanunjay, Shreya Ghoshal, Sunitha, Anurag Kulkarni, Shravana Bhargavi, and Raashi Khanna croon the songs. Srimani's lyrics for the song draw on Hindu scriptures and the stories of living deities like Rama and Venkateswara. The episode of 'Shiva Dhanur Bhangam', narrated in the first half of the song, comes with a language that tenderly prompts the listener to experience the beginning of the love story of the Rama-Sita duo. 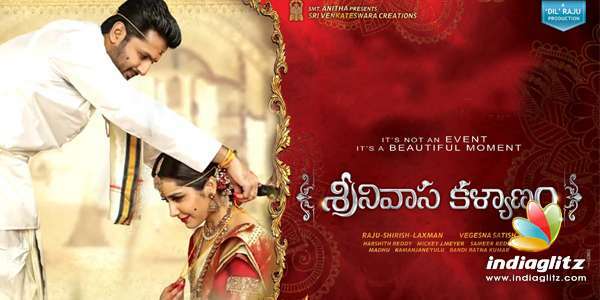 The second half is equally enchanting as it goes about glorifying the unique marriage story of the Lord of Tirumala. SP Balasubramanyam adopts a heavy yet soothing style of singing to convey the emotions. Mickey J Meyer deploys minimal instruments and the emphasis is more on the raga. He doesn't abandon his time-tested style of kickstarting the number with a trendy tune. The tempo of the song is quite Devi Sri Prasad. Mickey's music is lively for the number, although it's not really novel. The song is conceived to introduce to the audience the hero's ideology of happiness lies in little things, joy lies in sharing, and real enjoyment is what you have with your family members (repeating the 'Shatamanam Bhavati' idea). Srimani's lyrics are a mix of banalities (one line borrowed from that timeless 'Sunday roju pandaga vasthe take it easy policy' magic) and non-banalities. Dhanunjay is enjoyable. It's unfathomable why Mickey has not outgrown some of his 'Happy Days'-era notes even after all these years. Even in a song as mellifluous as this one, rendered to perfection by the redoubtable Shreya Ghoshal, the influence of some of his early works is obvious. Srimani's lyrics come into their own here after a mediocre 'Ekkada Nuvvunte'. The song is elevated by Sunitha's familiar vocals. The melodiousness of her voice is complemented by Anurag Kulkarni's work. Ramajogayya Sastry's lyrics bring out the thinking of those solidly in love, tracking the promises of the lovers in good Telugu. The song's retro feel is enjoyable. The singers pull off a feat with their offbeat voices. The approach to the song is slightly maverick and is most welcome. Srimani's lyrics are engaging with their doses of doubles entendres. Mickey rocks, adopting a new style for him. Much like the album's first song, Kalyanam Vybhogam, this one too draws on references from scriptures. Srimani's lyrics pack a soothing, meaning-laden punch, mirroring the apparent way of life encompassing the Indian idea of marriage. Sunitha's voice is a massive treat, giving a sense of deja vu. This family song should elevate the mood even as part of the film. Chorus is taken care of by Sri Devi, Padma, Ramya Behara, Mohana Bhogaraju, and Anil Annimalle. This song complements the theme driven by 'Vinavamma Toorupu Chukka' and the other song by the same title. Somewhere, the tune seems to resemble the timeless 'Chilaka Ye Thodu Leka' song from 'Subhalagnam'. The chorus is by Ramya Behara and Mohana Bhogaraju. A good family album, if one may call so. It's a balanced one. Fine lyrics come with neat language. Mickey J Meyer is on the spot.